For George H. W. Bush, the distinction between campaigning ("politics") and governing ("principles") was crucial. Once in office, he abandoned his campaign mode and with it the rhetorical strategies that had brought electoral success. Not recognizing the importance of rhetoric to policy formation and implementation, Bush forfeited the resources of the bully pulpit and paid the price of electoral defeat. Here, scholars explore the first Gulf War, the fall of the Berlin wall, the "New World Order," Bush's "education presidency," his environmental stance, the "vision thing," and the influence of the Religious Right. The volume concludes with an analysis of the 1992 re-election campaign and Bush's last-gasp use of economic rhetoric. 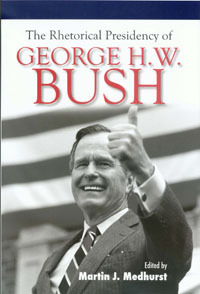 The contributors draw on the resources of the Bush Presidential Library and interviews with many of Bush's White House aides. They also suggest how embracing the art of rhetoric might have allowed Bush to respond more successfully. The Rhetorical Presidency of George H. W. Bush breaks important ground for our understanding of the forty-first president's time in office and the reasons it ended so quickly. MARTIN J. MEDHURST, who holds a Ph.D. from Pennsylvania State University, is Distinguished Professor of Rhetoric and Communication at Baylor University. He is the founding editor of Rhetoric and Public Affairs.